Collect from the wild - definitely not recommended unless you are sufficiently expert to distinguish between edible species and their poisonous lookalikes. Some so called edible species need to be cooked in a certain way to break down toxins. Buy from shops - many supermarkets in the UK now sell a range of species including fresh wild mushrooms. Home cultivation - the most difficult but potentially the most rewarding method. Currently indoor cultivation is limited to saprotrophic species. It is not possible to provide adequate guidance to the identification of edible and poisonous species of fungi on a Web page. Fungi are very variable in appearance (e.g. due on age and environmental conditions) and most species can't be accurately identified simply by looking at pictures. There are no reliable rules about which mushrooms are safe to eat and which are poisonous. The best advice is to join a local fungus recording group and go out with experts who can teach you how to identify specific species. Do not eat any mushroom unless you are absolutely sure of its identity. In addition, you should not collect endangered or rare species. 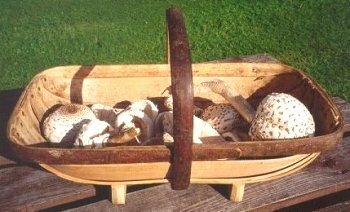 Read the Wild Mushroom Pickers' Code of Conduct before collecting fungi for scientific study or for the pot. The market is still dominated by one species, Agaricus bisporus. Several sizes are sold; button, closed cup, open cup and large open mushrooms or flats. These correspond to different phases in the growth cycle of the mushroom and are not different varieties or species. There are two types of Agaricus bisporus, the white form (Agaricus bisporus var hortensis) and a brown form. Mushrooms of the latter variety are called chestnut mushrooms or brown caps. More recently, the names crimini or portabellini (brown button mushrooms) and portobello or portabella (brown open flats) have been introduced. These names are a clever marketing ploy giving the impression that there are several different species or varieties for sale. Some of the species in the list below are now cultivated indoors on a relatively large scale and sold in most supermarkets while others are produced on a more limited scale and may only be available at certain times of the year. The list is based on species that I have come across in shops around the Manchester area and includes their most frequently used common name(s). Enoki, Golden mushroom Flammulina velutipes Grown as a long stemmed mushroom with tiny caps the cultivated form looks very different from what you find in the wild. Beech Mushroom Hypsizygus tessulatus Firm and crisp texture with a nutty flavour this species is popular in Japan. It has only recently been introduced to the UK. Horse mushroom Agaricus arvensis Related to the common cultivated mushroom, the horse mushroom is currently only produced on a very small scale. Lion's mane Hericium erinaceum This white fungus with its long pointed spines is an endangered species in the UK and should not be collected from the wild. However, it is commercially cultivated indoors and can be safely gathered from supermarket shelves. Oyster mushrooms Several species from the genus Pleurotus Widely available and easily identified by its characteristic shell-like shape (see picture on this page). Includes brown, grey, yellow and pink forms. Braunkappe, Wine Cap Stropharia rugosoannulata Cultivated outdoors in several European countries this mushroom is only rarely found in UK shops. Shiitake Lentinula edodes Traditionally produced outdoors on logs in Japan and China shiitake mushrooms are now also grown indoors on a sawdust-based medium. Fresh and dried mushrooms are commonly available. Straw mushroom Volvariella volvacea Canned button mushrooms can be obtained from Chinese supermarkets and the caps are sold preserved in oil as an "antipasto". Wood blewit, Blewit Lepista nuda Collected from the wild and sold on market stalls in the Midlands the blewit is now also grown indoors. Some people are reported to be allergic to this mushroom. Fresh wild fungi, most of which have been imported from other European countries, are now available from some supermarkets in the UK. Many of these fungi are mycorrhizal species growing in an intimate association with trees. To date, it has not proved possible to cultivate these species in the absence of the host tree. Preserved wild fungi (canned, bottled or dried) are also becoming increasingly common on supermarket shelves. Be careful to follow any cooking instructions supplied with these types of fungi. or Tuber aestivum You may come across the black and other types of truffle bottled or canned in brine. However, although the texture of the truffle is retained most of the aroma is lost during the preservation process. See also Truffles from Italy. Chanterelle, Girolle Cantharellus cibarius Yellow, funnel-shaped mushroom with blunt ridges instead of gills. A related species having a darker cap (Craterellus tubaeformis, the Autumn Chanterelle) is also sold. Fairy ring mushroom, Mousseron Marasmius oreades Small bell-shaped mushrooms with gills that are normally sold in the dried state for use in stews etc. This mushroom often grows in association with poisonous Clitocybe species and great care must be taken when collecting from the wild. Morille, Morel Morchella esculenta Fresh and dried morels are available from shops in the UK. Morels lack gills and have a conical, honeycombed cap. Ovolo Amanita caesarea A relatively rare species that so far does not appear to be available in the UK. However, you may come across fresh 'ovoli mushrooms' for sale in northern Italy or Switzerland. Pied de mouton Hydnum repandum Cream to pale yellow-coloured mushroom with spines instead of gills. Texture and taste similar to the chanterelle. Porcino, Cep Boletus edulis Mainly sold in the form of dried slices and used as a flavouring agent for sauces and stews. Many commercial mushroom soups contain this species as the major flavour component. St George's Mushroom Calocybe gambosa Only available in spring fruiting around St George's Day. Trompette des morts Craterellus cornucopioides Dark, trumpet-shaped mushroom without gills. Home cultivation can be carried out indoors using pre-inoculated kits or by preparing and inoculating your own substrate. The latter method requires some knowledge of aseptic techniques and certain equipment (e.g. a small autoclave or pressure cooker). You can obtain training in cultivation methods by going on a course such as the ones run by Paul Stamets, founder and president of Fungi Perfecti located in Olympia, Washington, US. I attended one of his weekend workshops in September, 1996 and subsequently published an article about it in the Mycologist. Click here to read this article on-line. 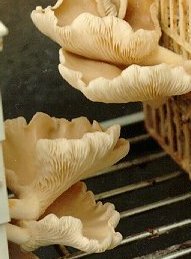 One of the easiest types of mushroom to grow are the Oyster mushrooms (Pleurotus species). Oyster mushrooms grow on a wider range of cellulosic wastes than species from any other group. Known substrates include most hardwoods, sawdust, paper, cereal straw, corn cobs, sugar cane bagasse, coffee grounds, banana fronds and cotton spinning wastes. Oyster mushrooms are fast growing, commercial spawn is available and you get less contamination problems than with other species. If you have the space you can also try growing edible fungi outdoors by inoculating tree stumps, logs or prepared compost beds. It is obviously a more hit and miss affair than indoor cultivation under controlled conditions but you can experiment with species that are difficult or currently impossible to grow indoors. Grigson, J. (1978). The mushroom feast. Penguin Books, Harmondsworth, UK. Carluccio, A. (1989). A passion for mushrooms. Pavilion Books Ltd, London. Lloyd-Davies, V. (1992). The mushroom cookbook. Salamander Books Ltd, London. Taylor, P.A. (1998). Patricia's mushroom cookery - vegetarian dishes. MycoNova, London. Last updated on 18 October 2004. Copyright � 1999-2004, all rights reserved.